The Digital Mont'e Prama project is a collaborative effort between CRS4 (Visual Computing Group) and the Soprintendenza per i Beni Archeologici Sardegna (ArcheoSAR, the government department responsible for the archaeological heritage of Sardinia), which aims to digitally document, archive, and present to the public the large and unique collection of pre-historic statues from the Mont'e Prama complex, including larger-than-life human figures and small models of prehistoric nuraghe (cone-shaped stone towers). The Mont'e Prama complex is a large set of sandstone sculptures created by the Nuragic civilization in Western Sardinia. 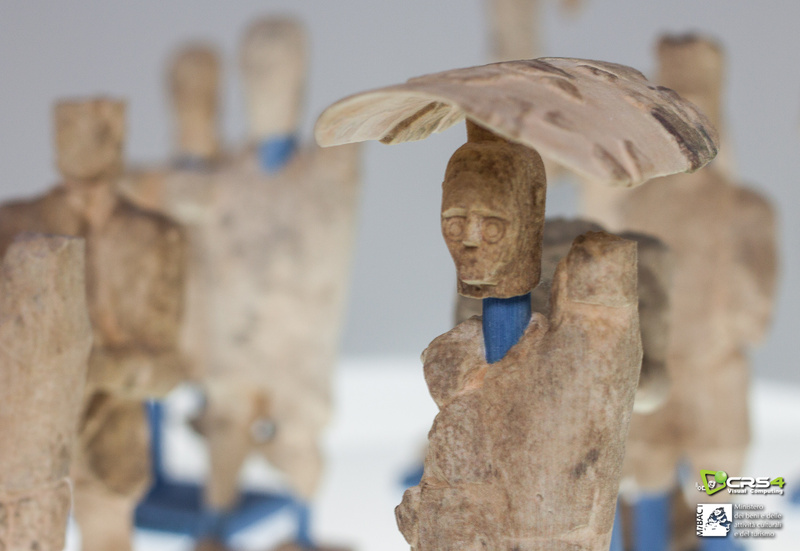 More than 5000 sculpture fragments were recovered after four excavation campaigns carried out between 1975 and 1979. According to the most recent estimates, the stone fragments came from a total of 44 statues depicting archers, boxers, warriors and models of prehistoric nuraghe came out of these first excavation campaigns. New excavations are ongoing and have already led to the discovery of other statues. These can be traced to an as-yet undetermined period, which goes from the tenth to the seventh century BC. 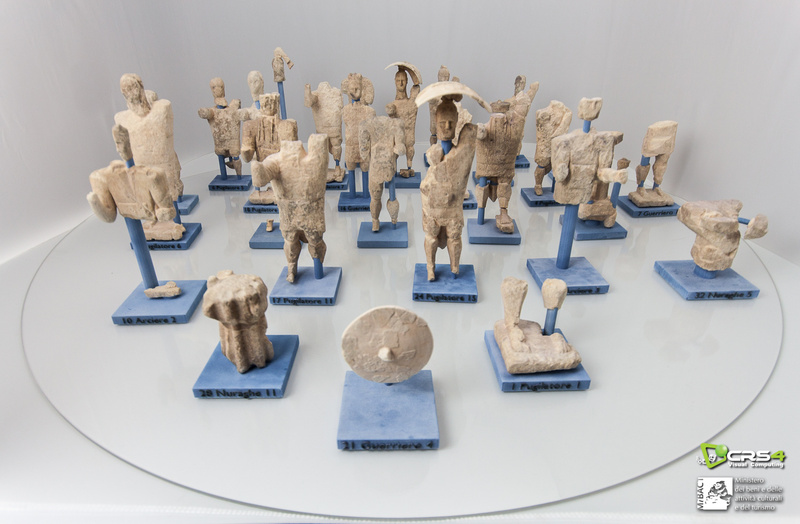 Restoration, carried out at the Centro di Restauro e Conservazione dei Beni Culturali (CRCBC) of Li Punti (Sassari, Italy) resulted in the partial reassembly of 25 human figures with height varying between 2 and 2.5 meters, and 13 approximately one-meter-sized nuraghe models. Following modern restoration criteria, reassembly was performed in a non-invasive way (no drilling or bolt insertions into the sculptures). Definitely joining fragments have been glued together using a water-soluble epoxy resin, and all the gaps on the resin-filled surface were covered with lime-mortar stucco. Custom external supports have been designed to sustain all the parts of a statue in order to ensure stability to all the components without the use of mechanical attachments, while minimizing contacts with the statue and maximizing visibility. All supports allow a 360 degree view of the statue. CRS4 is a leading Italian research center focusing on state-of-the-art computational technologies and on their application to problems stemming from natural, social and industrial environments. Visual Computing activities focus on the study, development, and application of scalable technology for acquiring, creating, distributing, exploring, and analyzing complex objects and environments, as well as for integrating them in real-time interactive visual simulations and virtual environments. CRS4 Visual Computing research is widely published in major journals and conferences, and many of the developed technologies have been used in as diverse real-world applications as internet geoviewing, scientific data analysis, surgical training, and cultural heritage study and valorization. Novel approach for improving the digitization of shape and color of 3D artworks in a cluttered environment using 3D laser scanning and flash photography. In order to separate clutter from acquired material, semi-automated methods are employed to generate masks used to segment the range maps and the color photographs. This approach allows the removal of unwanted 3D and color data prior to the integration of acquired data in a 3D model. Sharp shadows generated by flash acquisition are easily handled by this masking process, and color deviations introduced by the flash light are corrected at the color blending step by taking into account the geometry of the object. The approach has been applied to the large scale acquisition campaign of the entire Mont'e Prama complex, and has so far covered 37 statues mounted on metallic supports. Color and shape were acquired at a resolution of 0.25mm, which resulted in over 6200 range maps (about 1.3G valid samples) and 3817 photographs. The resulting colored models are used for a variety of applications, from documentation, to virtual exploration, to 3D printing. Small copies of the statues have been printed using special detail-enhancing techniques designed for 3D printers that produce colored replicas made of a mixture of glue, ink, and clay powder. 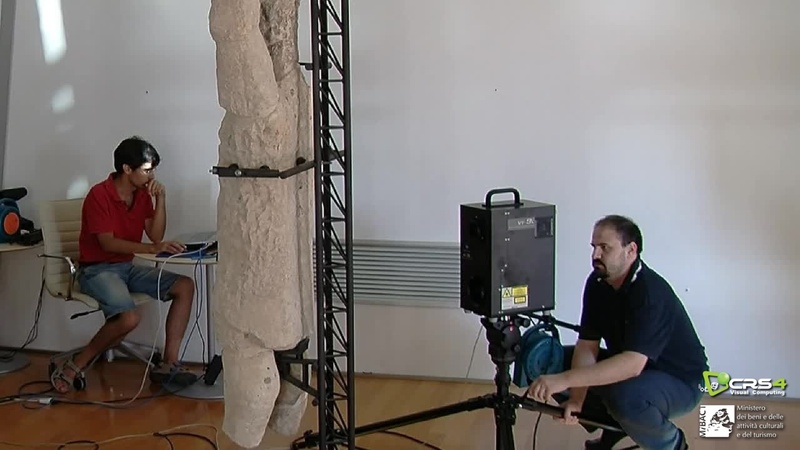 Novel techniques for interactively exploring very detailed 3D digital models in museum settings. We introduced scalable multiresolution rendering techniques and a novel user interface and system for exploring extremely detailed 3D models in a museum setting. 3D models and associated information are presented on a large projection surface controlled by a touch-enabled surface placed at a suitable distance in front of it. Our indirect user interface combine an object-aware interactive camera controller with an interactive point-of-interest selector and is implemented within a scalable implementation based on multiresolution structures shared between the rendering and user interaction subsystems. The approach led to a number of research publications and to the development of systems that have been installed in museums and events throughout Europe. Novel scalable techniques for the distribution and exploration of annotated 3D digital models in mobile settings. Our approach integrates a networked architecture for adaptive on-device rendering of compressed multiresolution surfaces with a simple and effective interactive camera controller customized for touch-enabled mobile devices. During interaction, knowledge of the currently rendered scene is exploited to automatically center a rotation pivot and to propose context-dependent precomputed annotated viewpoints. The approach led to a number of research publications and user studies. 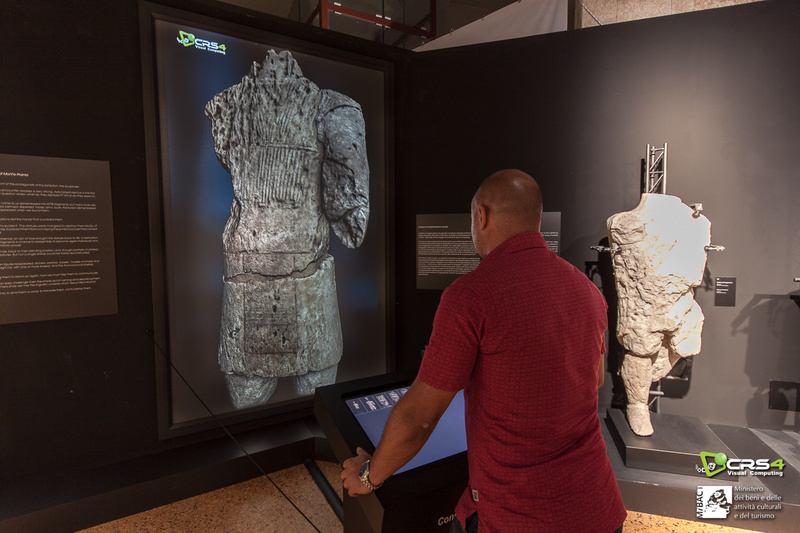 Work is ongoing to integrate the method with the museum system in order to provide an integrated approach for the exploration of annotated 3D models. Best Paper Award at Digital Heritage 2015 (Digital Heritage International Conference, 28 September 28 - 2 October 2015, Granada - Spain) for the paper: Marcos Balsa Rodriguez, Marco Agus, Fabio Bettio, Fabio Marton and Enrico Gobbetti. 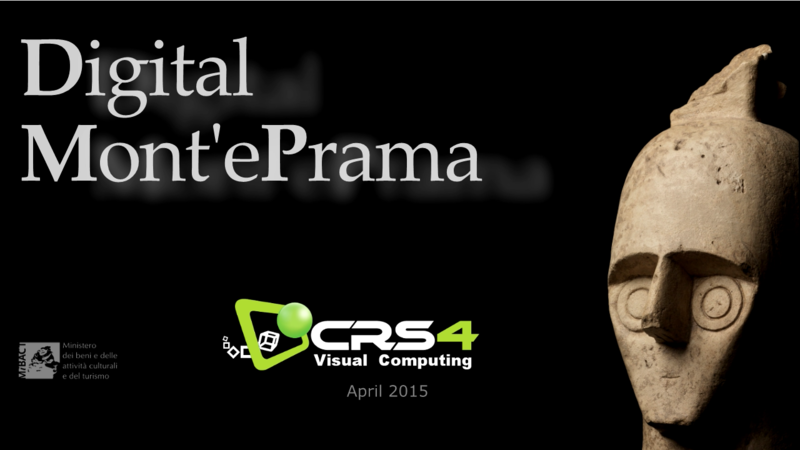 Digital Mont'e Prama: 3D cultural heritage presentations in museums and anywhere. In Proc. Digital Heritage. Pages 545-552, September 2015. Best Paper Award at Digital Heritage 2013 (Digital Heritage International Conference, 28 October - 1 November 2013, Marseille - France) for the paper: Fabio Bettio, Enrico Gobbetti, Emilio Merella, and Ruggero Pintus. Improving the digitization of shape and color of 3D artworks in a cluttered environment. In Proc. Digital Heritage. Pages 23-30, October 2013. Visual Computing temporary exhibit at 65th International Trade Fair of Sardinia - April 25th to May 6th 2013 (about 3000 visitors). Single and dual-screen setups. 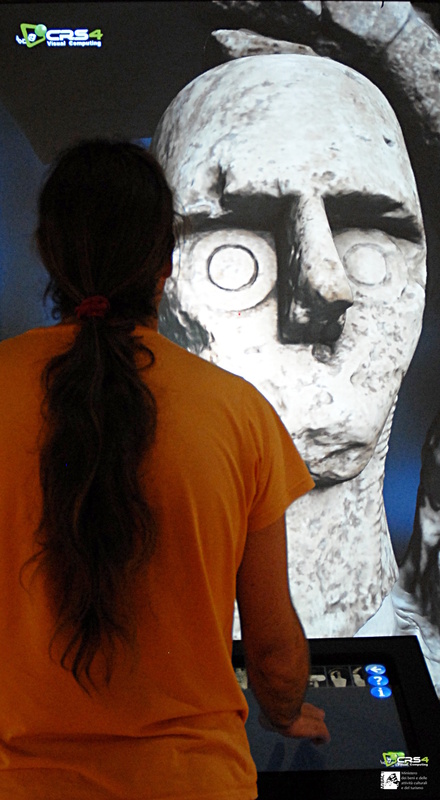 Large screen interactive projections of research results, including early presentation of Digital Mont'e Prama models. Permanent exhibitions at the National Archaeological Museum in Cagliari and at the Cabras Civic Museum - Opening March 22nd 2014 (ongoing). Museum system based on a dual-screen setup, with statues presented on large back-projection screen in portrait mode (2.5m height). 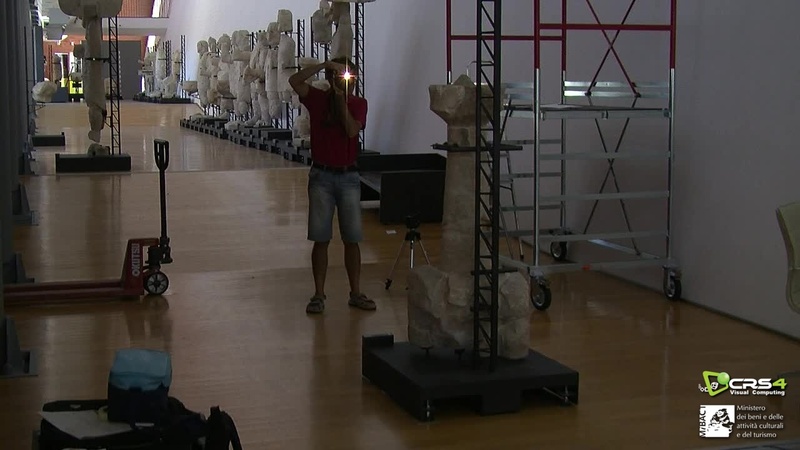 The system is installed in the same exhibition rooms as the statues. Over a hundred thousand visitors per museum in 2015. 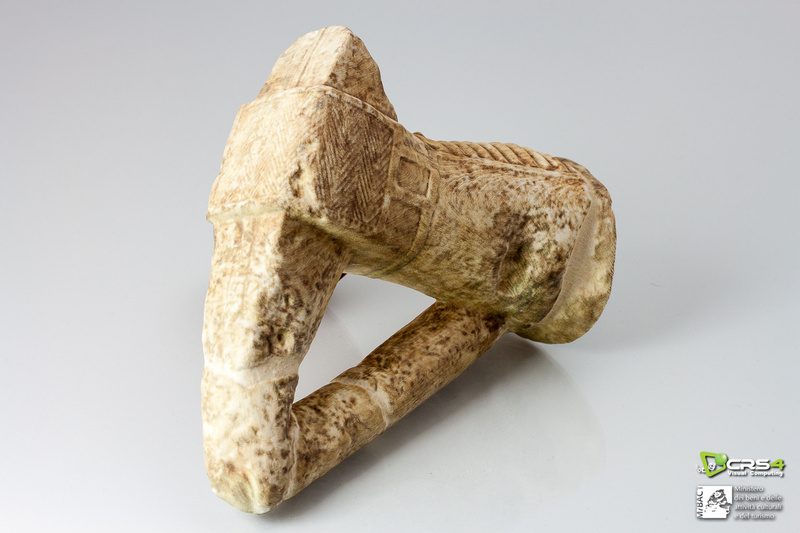 Temporary exhibitions at the National Prehistoric Ethnographic Museum Luigi Pigorini in Rome (November 29th 2014 to March 21st, 2015) and at the Civic Archaeological Museum in Milan (May 7th to November 29th, 2015). 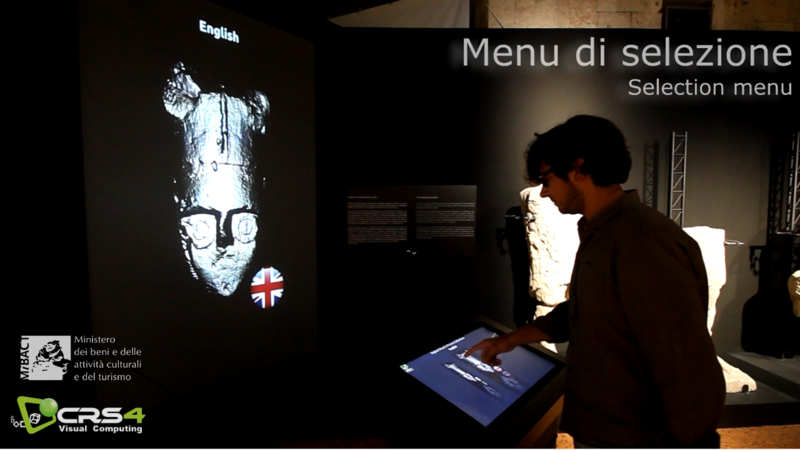 Museum system based on a dark room with dual-screen setup, with statues presented on a large back-projection screen in landscape mode (3m x 2.5m). Temporary exhibition at EXPO 2015, Milan (September 11th to 17th, 2015) and at the Archaeological Museum of the University of Zurich (April 15th to September 25th, 2016). Interactive system based dual-screen setup, with statues presented on a 85 inch 4K monitor in portrait mode. 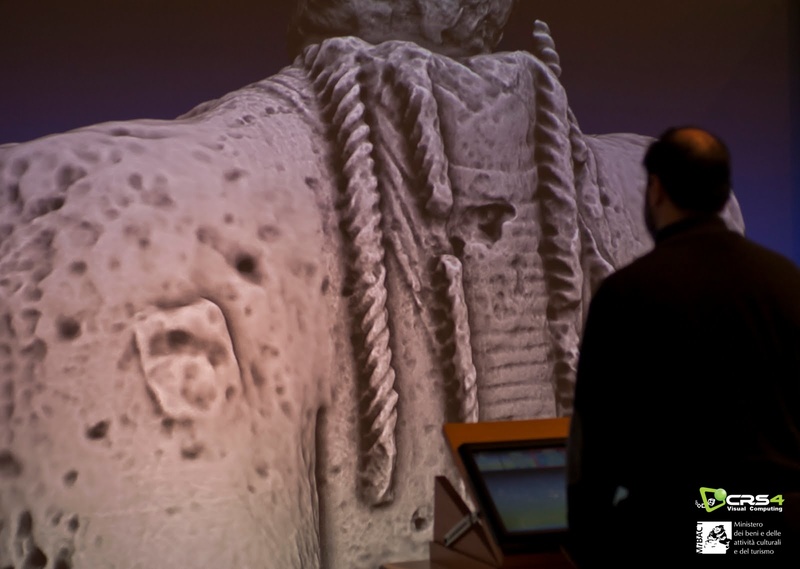 Illustrative video of the Digital Mont'e Prama project: acquisition, 3D model creation, physical reproduction, 3D exploration, museums and installations. Illustrative video presenting our simplified user interface. Interactive 3D exploration using a touch screen and a 4K monitor. 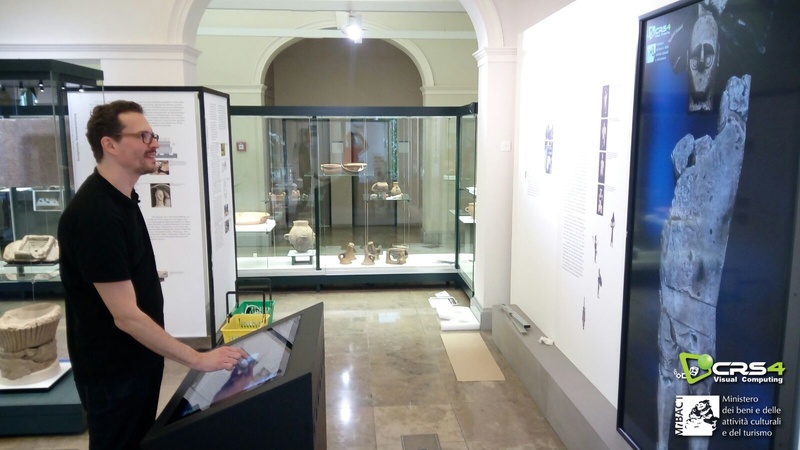 Temporary installation at the Archaeological Museum of the University of Zurich, Switzerland. Interactive 3D exploration using a touch screen and a large-scale back-projection system. Temporary installation at the National Prehistoric Ethnographic Museum Luigi Pigorini in Rome. Interactive 3D exploration using a touch screen and a large-scale back-projection system. Permanent installation at the Cabras Civic Museum. Interactive 3D exploration using a touch screen and a large-scale back-projection system. Permanent installation at the National Archaeological Museum in Cagliari. Acquisition phase. Geometric acquisition using a triangulation laser scanner. Acquisition phase. Color acquisition using calibrated flash photography. Processing phase. Left: photo of a boxer. Center: virtual reconstruction - shape only - resolution 16 samples/mm2. Right: virtual reconstruction - shape and color - resolution 16 samples/mm2 -- synthetic relighting based on measured reflectance values. 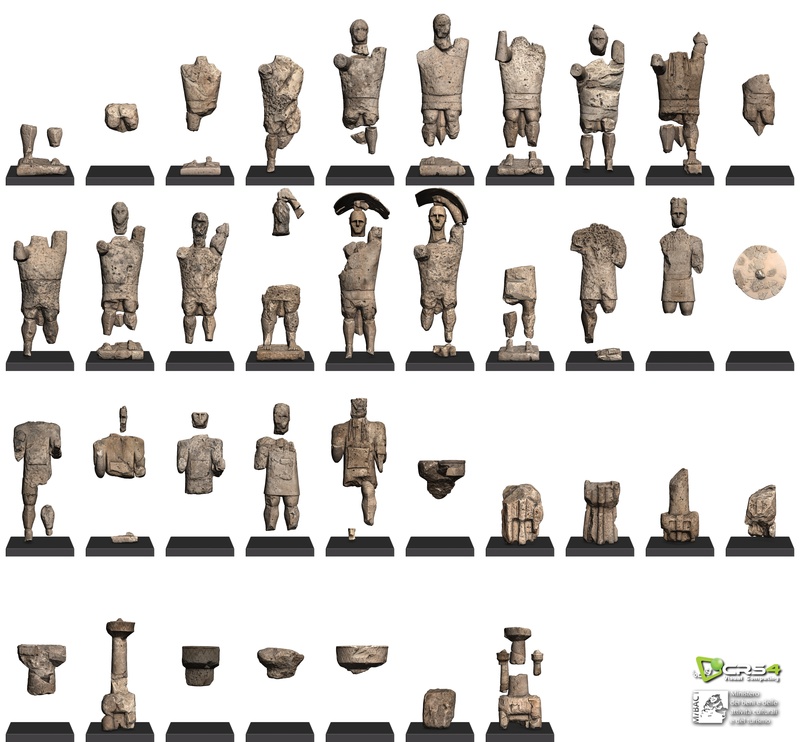 Virtual reconstruction of the Mont'e Prama complex -- 37 statues at a resolution of 16 samples/mm2. Physical reproduction using a 3D printer (glue and clay powder).